Holidays - I hope the Christmas season was a peaceful one for each of you and that it filled you full of joy and big dreams for the new year that begins today. May yours be blessed with overflowing delights. 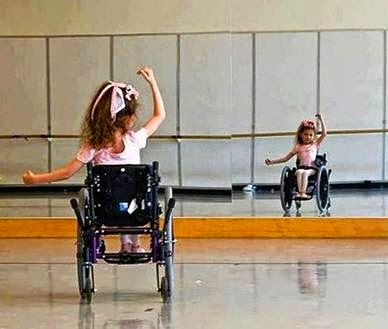 We're never too old to dream and make our dreams come true. 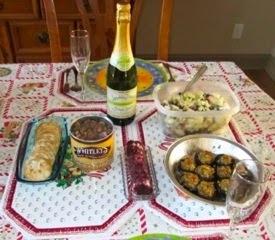 We had a really nice Christmas Day with a simple lunch that you could call an appetizer lunch I guess. It included Whole Grain Water Crackers, Sea Salt Caramel Peanuts (Boy Scouts), Cranberry Goat Cheese Log, Waldorf Salad, Stuffed Mushrooms and Sparkling White Chardonnay Grape Juice. The highlight was video/talking with our son for 2-1/2 hours on Face Time. That's an app for Apple computers that our son knew about. Randal and I both have Apple computers so it was nice to learn about it. We had used Google Hangouts last Christmas and it wasn't very reliable or very clear. Face Time worked much better without any problems and you could take photos of the video with a push of a button, so we got to photograph our son opening his presents. He's 35, but ya know, you can still see that gleam of joy in his eyes just like he was only 5 years old. Birds - We've been hearing the owls calling for mates. We get the Barred Owl and the Screech Owl. We had a Great Horned Owl many years back but when they cut down some forest adjacent to the woods behind us, he returned no more. I found some great information on birds that breed in winter and thought I'd share it with you. It's from eBird.com. At this site you can track your bird lists, record the birds you see, share sightings, explore maps and graphs and contribute to science and conservation. Here's some information on winter breeding from the article: Breeding Season Begins in Winter by Doug Gross, Pennsylvania. Barred Owls start announcing themselves with their deep “who cooks for you” hoots a few weeks later and are breeding by mid-January. A trip to your local birding hotspots at night could yield some hooting owls, increasing your site’s species list and adding a breeding bird report. Great Horned Owls often hoot just before the sun goes down. Other birds can begin nesting early. 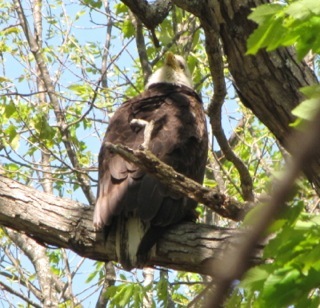 Bald Eagles are rebuilding nests in winter and many will have incubating eggs by the end of February. Several resident songbirds begin singing in winter, already beginning to set up territories and attract mates. Although not as glamorous as owls and eagles, Rock Pigeons also are “in the mood” by January. By February 1, another established exotic—the House Sparrow—also can be counted among breeding species. They may not be glamorous, but it is interesting how these exotic species have adapted to North America, and provide urbanites with birds to watch. Common Ravens are among the early nesters, building large stick nests on cliffs and artificial structures such as transmission towers and football stadiums. Their loud croaks declare their presence from a long distance. Ravens once were exclusively birds of mountain forests, but now nest in agricultural areas. By mid-March, most woodpeckers are in breeding mode and are drumming to declare territory and attract mates. It is a trick to learn to identify drumming woodpeckers to species, but worth the effort. The loud, resonating drumming of the large Pileated Woodpecker can be heard from long distances. It is easier to see woodpeckers early in the season rather than after leaf-out. 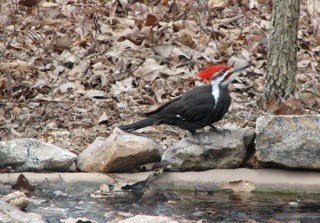 The displays and courtship of woodpeckers are a feature of the woodland birding in March and April. Popular backyard and forest resident songbirds such as Carolina Chickadees, Tufted Titmice and Northern Cardinals also can be counted as breeding birds in mid-March. Black-capped Chickadees a bit later, by mid-April if not earlier. Many males begin singing on brighter winter days. Ruffed Grouse are drumming and woodcock are ‘sky dancing’ by early April. Both species are of great interest to the conservation community and records of these species are very much appreciated in eBird. Print the recipe from the website. 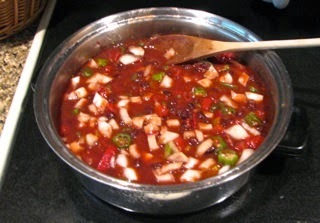 Winter Recipe - Our son sent me a link to a recipe for Cajun-Seasoned Vegetarian Gumbo. Sounded good and I couldn't believe how easy the recipe was. We make up a big pot of something and then eat it all week long. Keeps menus simple and appetites in control by not giving in to cravings. We try to keep in our minds that we "eat to live, not live to eat." Let me know if you make it and what you and your family thinks of it. We really loved it served on brown rice. Great protein meal with lots of veggies thrown in. And, by the way, you don't taste the okra. Some folks think it gets real slimy but didn't happen. Not that much of it really considering the entire recipe. Shopping Trivia - Thanks to Charlene Buffum for letting me know about the world's first virtual shopping center that opened in Korea. No, I don't travel that far to shop ... but it's a unique way to do it and no doubt it will be one of those virtual things that spreads across the world if all goes well. In this shopping center, all the products aren't actually the products. They are life-sized LCD screens that look like the product but you order each item by touching the screen or using your SmartPhone to scan in the code. When you get to the counter, your items are already bagged and ready to go, or you can have it delivered since you don't even have to be at the "store" to order. 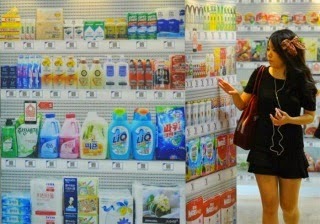 You can scan a code of a product from your home when you are about to run out. No more write-offs for stolen merchandise. The store premiered in 2011, but since then has spread to England. If you've not heard about it, like me, you can get an update on how well it's going for the company here ... also the advantages and disadvantages. Read more. Forest and Critters - There wasn't even a breeze when this huge oak tree uprooted and fell to the ground between the evergreen trees on the front bank. I feel as though I lose a friend every time a tree dies on our property. We call that area Bird Land or Cardinal Corner since we moved all the pines and cedars we found on our one acre of property there for birds to nest in the cedars and eat berries and the squirrels to chew the pinecones. We guessed it was 40' since part of the top had already fallen off years back, but when we measured it we found it to still be 57 feet tall. It had been dead for years, but we leave them stand for the bugs and birds, especially the woodpeckers. Randal will now cut this into pieces he can haul to the back at the property line for the birds, lizards and such. I've asked him to make a few tall stumps that we can sit on as stools, but that can wait till warm weather comes since we can't replace the rotten ones now ... they surely have things wintering-over in them. I love placing them around the property, so it will look pretty to replace them. Although wildlife doesn't care about pretty, the visuals for me are good. Chain saws are not a treasured sound for me but I can take it when Randal is using one because we are putting the wood to good use. Repurposing in a different fashion is the way I see it. We let it stand until it decides to stop standing and then make use of it so it has another purpose closer to the ground. 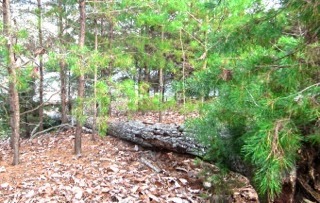 I can see the woodpeckers enjoying the tree on the ground. The pileated is most common one working them over once they're on the ground. But I've found newts under the stumps and even lizards who have dug under and laid eggs. 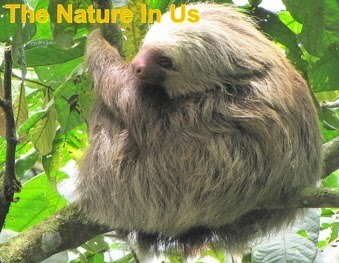 It's all part of the forest, as long as it happens naturally, it's okay with me. I consider the roots its nerves and those have been severed, so there is no pain for it. Only joy in being part of our forest so he can be "laid to rest" with love, joy and a provision for it to bring life to other wildlife. 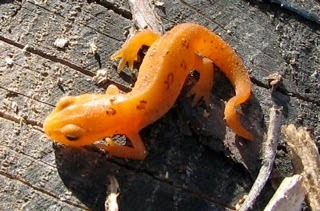 The Red-spotted Newt that we discovered by lifting one of our "stools" was such a beautiful orange color. It's the juvenile stage of growth. As adults they look totally different, other than the red spots which can still be seen. We have lots of them in our small pond and when we clean out leaves in the Fall, we always go through the piles brought out of the pond to make sure there's no life within them. The newts must like it close to the top of the water because we get a lot of them wiggling around when we dump the leaves on the ground. We keep a bucket of pond water nearby and toss in everything we find that's living. We have some very beneficial bugs in the pond also so we have to look really close at it all. I love the tadpoles though. Maybe from my experience of being Mama Tad. I got that name from my husband when I decided to raise some Eastern Grey Treefrogs from egg to adulthood and release them. The treefrog that lived on our deck had mated with a female and she laid her eggs in the birdbath. We had bullfrogs in our pond that year so I didn't want to dump them in there as food. I thought that the female may have used her intuition and had good sense in laying her eggs in the bird bath. These critters know me too well. Travel Virginia - We took a Saturday outing to Richmond last month. To avoid feeling trapped inside, I've been scheduling some kind of outing each weekend. Since we both work at home, we need the diversity of activities. So instead of commuter miles, we like day trip miles instead. Since it was cold I looked for inside things and discovered the Virginia Center for Architecture. I love architecture although I really don't know much about it. Just like looking at buildings. The house that this place was in was a Tudor-Revival design built between 1916-1919. It has 11 levels which I still haven't figured out by looking at the exterior windows, but in some of the rooms there were stairs up to a balcony area which would be counted as another level. The house has 27,000 square feet, 14 fireplaces and 15 bathrooms. 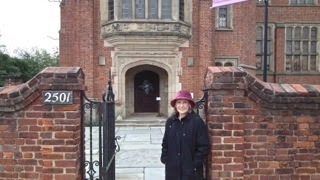 Sadly only the first floor was open to the public which is where all the exhibits were. But on that floor I found a lot of beautiful carved woodwork and interior design of the home itself. I love doors. When we've traveled to Europe I love taking photos of entrance doors to home as we walk by. I guess it's like they say, "They just don't build them like that any more." The Center for Architecture had an exhibit of the mid-Atlantic’s finest examples of architecture, interior design and preservation projects for 2014 in the 7th annual exhibition featuring award-winning work from the region. It was pretty interesting to see what architectural styles are winning awards these days. I'll be working those photos before the next newsletter comes out and will include the link in that issue. View Virginia Center for Architecture and History on The House That Branch Built Photos. Since the house is on Monument Avenue which contains many blocks of old historic homes, I decided to take some photos of the homes that were near the architectural center. Various forms of architecture in and of themselves. The Jefferson Davis Memorial was nearby also. These are in an album of city photos, so you can wander around that album if you'd like to see more of Richmond, Virginia. View Monument Avenue Photos. Hope = Confident expectation becoming my reality! What you see is not reality ... What the Bible says is. Stay close to God's Word and continue to believe!